The Recent view shows you every Office 365 document you’ve viewed or edited in recent history. Note: Another way to view your recent files is to type /files into the command box at the top of Teams. 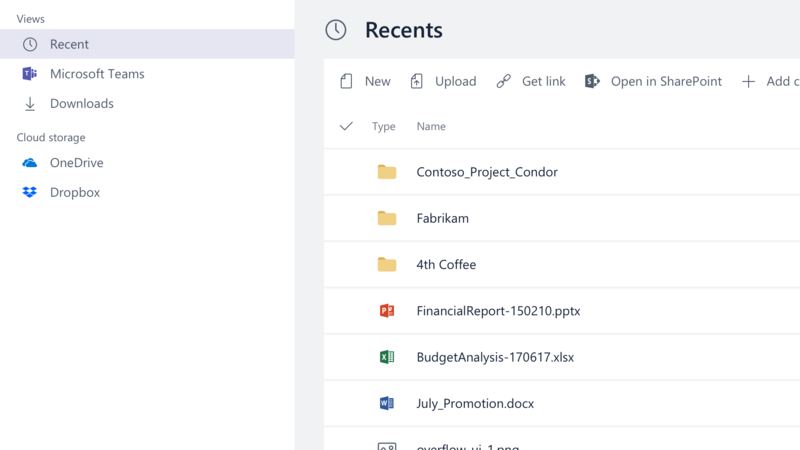 The Microsoft Teams view shows you all the documents that have been created or edited recently within your favorite channels. In the Downloads view, you'll see a list of all the files you've downloaded to Teams. The Cloud storage section shows all the different cloud storage services you've connected to Teams. Click one to see your cloud files. You can view the files in a specific channel by tapping Tabs > Files. You can see your recent files by tapping More > Files. From there you can see all your OneDrive files and open your OneDrive app to manage your files.